Daily activities can become more difficult as seniors age due to illnesses or physical difficulties. It may become impossible to manage dressing, bathing, or using the restroom without help. At a time, this may have meant that seniors had to move into a nursing home, but today’s seniors have more options to help them keep their independence and stay in their own homes. Assisting Hands provides a variety of senior in-home care services that help clients in Des Plaines, IL age in place where they feel most comfortable and secure. We make sure your loved ones receive the compassionate care they need and deserve, at a cost that is much lower than nursing home care. Assistance with Transfers. We’ll help clients transition safely to and from beds, chairs, and other pieces of furniture to ensure they don’t slip and fall. Bathing and Showering. Slipping is a hazard for anyone, but especially for seniors who are more prone to problems with balance. We’ll ensure that clients bathe safely. Dressing/Personal Grooming. Assisting Hands staff members will help your loved one dress daily, brush their hair, and assist with other grooming tasks to ensure that they look and feel their best. Morning and Evening Routines. We help clients get out of bed safely and guide them through their morning routines, including brushing teeth, and taking medication. In the evening, we’ll help them prepare for bed by assisting them with using the restroom, changing clothing, and other pre-bedtime tasks. Restroom Use/Incontinence. Our discreet caregivers can provide whatever level of assistance is necessary in the restroom, from help getting out of the wheelchair to full assistance, as well as help cleaning and changing clothes if necessary. Meal Preparation. Many people who live alone don’t want to go to the trouble of cooking healthy meals for one person, but prepared meals are often full of sodium or fat and eating out is expensive. We’ll prepare delicious, nutritious meals that meet all dietary guidelines. We take care of the shopping, preparation, serving, feeding assistance (if necessary), and cleanup. Errands. When someone loses their driver’s license, it makes so many daily chores almost impossible, especially if delivery or public transportation isn’t available or reliable. Our caregivers can take care of light errands including grocery shopping and picking up prescriptions so seniors don’t have to drive, especially in bad weather. Light Housekeeping. It’s difficult to keep a house tidy when a senior has vision problems and can’t see dust or can’t get out of a wheelchair to clean cabinets. We offer light housekeeping such as dusting, vacuuming, mopping, dishwashing, and more to help keep our clients’ homes clean and hygienic. Companionship. Many seniors don’t have family nearby and if they’re unable to drive, they can’t access social activities that help pass the time in an enjoyable manner. Our compassionate staff provides valuable companionship to our clients. We’ll engage them in conversation and fun activities to brighten their days and stimulate their minds. 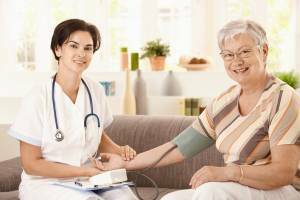 If you have a loved one in Des Plaines, IL who needs help around the home, call the highly skilled professionals at Assisting Hands Home Care. We provide the best quality, compassionate home care that allows our clients to stay where they feel most comfortable and secure. To learn more, contact one of our care coordinators at (847) 915-6186.